Twenty years ago, Alborosie exchanged Bella Italia for Jamrock and has been deeply devoted to study the roots of Reggae since. The musician, instrumentalist, singer and producer with Sicilian roots has settled permanently in Jamaica, family and studio included. From there, he reaches out with his new release Freedom & Fyah, a 13-track-affair that was produced and recorded almost exclusively at his Shengen Studio in Kingston (the only track that was not produced by Alborosie himself is Carry On, a powerful composition by Winta James), released under his label Shengen Ent. Reading the credits, Alborosie's name is everywhere, from writing to most of the instruments to recording. The only consistent addition is the brass section: Howard Foulds on sax and Hopeton Williams on trumpet add their skills to half of the songs, thus adding some diversity to the stringent sound created by the originator. The first piece called Prophecy includes words taken from the baptism of his son, a clerically tainted speech delivered by a certain Reverend Rohan Treleven. Despite the message included, his voice and way of speaking are a bit annoying so that temptation is high to just skip to the next track. Can't Cool soothes us with the far more pleasant voice of Alborosie, singing about Babylon, Rastafarian livity and historical references. Sugus, the former backing vocalist of Dennis Brown and Gregory Isaacs that shares family ties with the artist, is featured twice on the album and joins in on Fly 420. A Ganja-praise-song, it takes a stand against fertilizers and is out on video as well, in which Marihuana is impersonated by a naked, green-coloured beauty. "Me love me caliweed like a soundboy loves sound!" Cry, an outcry against gunman-violence in Kingston on a heavy rub-a-dub riddim which bass legend Flabba Holt fats up, and Strolling have a similar underlying beat, but the latter is made more interesting by the unique flow of Protoje, joining Alborosie in the announcement of the invasion of Rastaman into town. Starting out dubwise, Rocky Road talks about the challenges of growing up, finding fresh metaphors: "…from the tricycle to bicycle, to soda then to popsicle…". Fully concerned with the adult world, Poser should be known already since it's out on video for a year now. Although the examples cited in the video are quite obvious, Puppa Albo seems to be talking to us (as in some other songs as well) from high above, wagging his admonishing finger, and in the back of my mind I kept hearing "Judge not lest ye be judged." Thematically leading over to the next one, Alborosie shows that he is not only comfortable with Roots, but also feels at home with dancehallish tracks. Judgement is proof that Dancehall can be conscious. The last five songs include the very poppy love-song Life To Me featuring Ky-Mani Marley and the conscious, vocoder-saturated (Money Don't Make You) Rich as well as the above-mentioned Carry On. My personal highlight is Everything featuring the legendary Roots Radics (including the deceased Style Scott on drums!) and the sweet voice of Pupa Avril. Bim! Zion Youth (featuring Sugus once more) seems like the perfect closing, setting fire on Babylon and even citing the Gargamel Buju Banton. Says the artist in a recent interview with Angus Taylor: "Zion Youth is a concept I would like to push this year. If you listen to Reggae, you are a Zion Youth. If you are a conscious youth and you love Reggae, you are one of us – a Zion Youth." 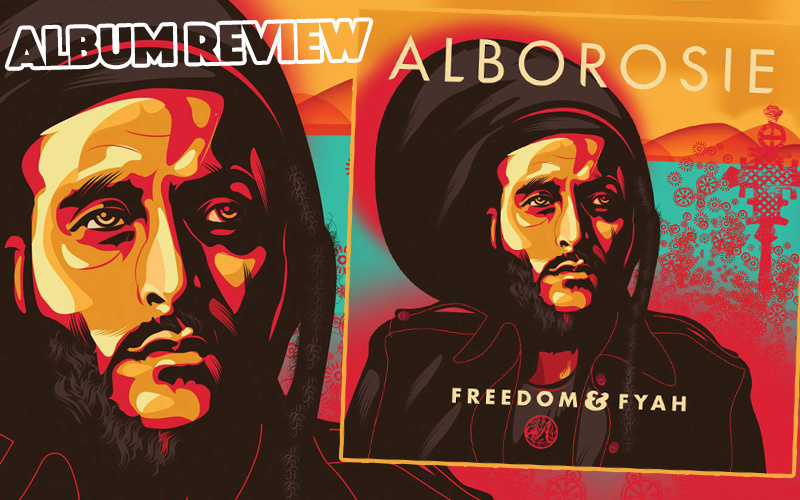 It was to be expected that the next Alborosie album will be a high-quality-production, and Freedom & Fyah more than fulfils these expectations. The songs are well-crafted lyrically and musically, no doubt; the general vibe, however, is gloomy and pessimistic – but this might be intentional. His fans certainly can't wait to see the tracks performed live!